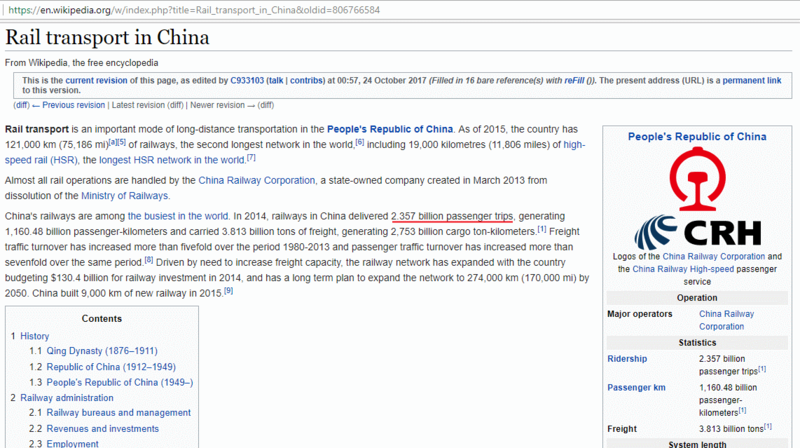 Britain needs HS2, because a page on Wikipedia says that Britain’s railways carried more passengers than China’s. The recent focus of Transport for the North’s “work” has been on understanding the case for Northern Powerhouse Rail to “serve eight ‘Other Significant Economic Centres’ (OSECs) across the north, which in the Leeds City Region includes Wakefield, Bradford, Huddersfield and York as well as Leeds” (according to the ‘HS2 and the HS2 Growth Strategy’ report to West Yorkshire Combined Authority dated 8 September 2017). As can be seen from the diagram below, these “OSECs” were mostly ignored in the original ‘HS3’ / NPR vision. It is interesting to compare the original TfN rail vision and the description of the “emerging vision”, reported to WYCA in October 2017. For example, ‘6 trains per hour, with a journey time of 30 minutes’ between Manchester and Sheffield, and ‘2 trains per hour, with a journey time of 30 minutes’ between Manchester airport and Sheffield. Apparently, this is to be delivered through “significant upgrades” to the existing Hope Valley line. Nobody was ever planning to electrify the railway to Scarborough, secretary of state Chris Grayling told the Commons transport select committee on 16 October, as he extolled the virtues of ‘hybrid’ and hydrogen powered trains. [Chris Grayling:] In East Anglia, all the cross-country routes will be operated by hybrid trains shortly. They offer a huge amount of flexibility. To take one example, on the trans-Pennine route hybrid trains are essential to continuing the service from Scarborough to Manchester airport. As you start to electrify the route, you have the flexibility to run electric trains over the parts that are electrified and, in this particular case, diesel on the parts that are not. Nobody was ever planning to electrify to Scarborough. It gives you flexibility that you do not otherwise have. Today, we are in the world of diesel-electric; it will soon be battery-electric, and it will be hydrogen-electric. It gives much greater flexibility to use trains in different ways around the network. On 16 October, secretary of state Chris Grayling MP faced transport select committee questions about the ‘policy priorities’ of the Department for Transport. One of the topics of interest to the committee was the cancellation of rail electrification schemes such as Oxenholme to Windermere, Cardiff to Swansea, and the Midland Main Line north of Kettering. Mr Grayling wanted to the focus on the journey time benefits of these projects, as he saw them, and portrayed the Midland scheme as a £1 billion outlay, to save one minute. [Chris Grayling:] Do we really think it is worth spending nearly £1 billion to save a minute on the journey time and deliver new trains three to four years later? And erecting wires from Cardiff to Swansea would be a ~£500 million outlay which would make ‘no difference whatsoever to passengers’. On ‘Northern powerhouse rail’, which he supported, Mr Grayling said that ‘junction provision’ is to be funded as part of the HS2 budget. [Graham Stringer:] How does the possibility of platforms for HS3, in effect, under Piccadilly fit in with HS2 and the decisions there? When do the decisions have to be made? [Chris Grayling:] The truth is that I do not know. The Chancellor has agreed that, as part of the HS2 budget, we will fund the junction provision that we need to enable the northern powerhouse rail network and HS2 to link together. That applies to the route from Liverpool to Manchester, because clearly you want the two routes to follow the same track from the eastern point, through the airport and into Manchester. Likewise, you want provision in south Yorkshire and, indeed, the east midlands, to create the potential to link up Leicester and Nottingham in the future. The Treasury has agreed that the money will be provided. We will put that into the hybrid Bill when it comes. That passive provision is there as part of that project. together, Newcastle upon Tyne and York produced roughly the same London traffic as Manchester did. At both Leeds and Manchester, new-build terminal stations, with 400-metre platforms, would be built for the exclusive use of HS2 trains. But HS2 services to York and beyond would make use of existing platforms, and be limited to 200-metre length. With destinations between Newcastle and York taken into account, the cumulative demand to and from York might actually exceed the demand at Manchester. If short HS2 trains, and short platforms, are deemed adequate to meet expected demand from York, and points north thereof, why are HS2 Ltd proposing to build new termini in Manchester and Leeds? The available information suggests that the Birmingham, Manchester and Leeds HS2 termini, and their 400-metre platforms, do not serve an obvious or clearly-defined transport purpose. On 18 October the Railway Gazette published a story about an inquiry led by former head of Air France-KLM Jean-Cyril Spinetta, which “will investigate multiple issues across the French rail sector, including low ridership on regional passenger trains and the precipitous decline in rail freight seen in recent years”. However, the story barely mentioned the role of the TGV network in the diminished performance and viability of SNCF. According to a Le Figaro report (19 September 2017), 70% of TGV service is loss-making. ‘Surexpansion’ of the TGV service seems to have gone hand-in-hand with ‘une négligence progressive’ of the classic network. A 420-mile (676 km) high speed railway between London and Scotland could be built for ‘as little as £11 billion‘, according to Network Rail chief Iain Coucher, The Times reported on 9 May 2006.